When you see a lot of movies, it’s always refreshing when you come across one that is thrillingly unpredictable. That definitely describes Jim Mickle’s Cold in July, which premiered at this year’s Sundance Film Festival. While most movies follow a certain trajectory, Cold in July pulls its audience into one tone, and then explodes it over halfway through the picture only to blow it up yet again. 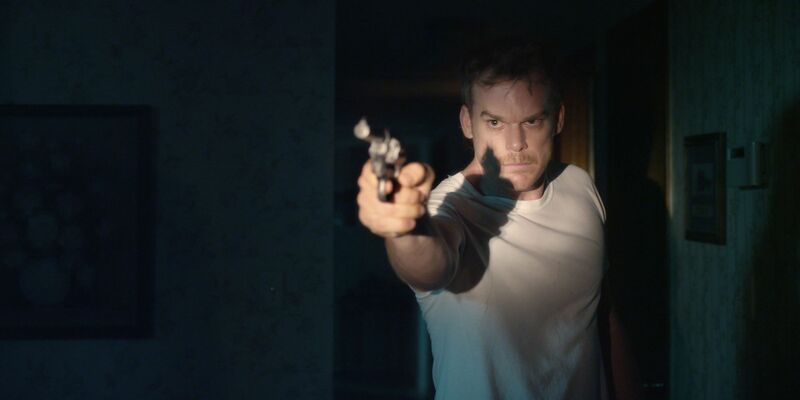 If you not familiar with the film, the one line synopsis from Sundance is, “after killing a home intruder, a small town Texas man’s life unravels into a dark underworld of corruption and violence.” The film stars Michael C. Hall, Don Johnson, Sam Shepard, Vinessa Shaw, Nick Damici, and Wyatt Russell. For more on the movie, read Matt’s review. While at Sundance, I landed an exclusive video interview with Michael C. Hall and Vinessa Shaw. They talked about the experience of reading the script for the first time, what the story is about, what it means to be part of Sundance, future projects, and more. Hit the jump to watch. What it means to be a part of Sundance and when they found out the film was accepted. 2:00 – Pitch the story for people who haven’t seen the movie. 3:30 – Talk about the experience of first reading the script. 6:00 – Shaw is working on the indie project Bereaved now and a guest arc on Those Who Kill. 6:40 – Hall’s next project is The Realistic Joneses Broadway play.